Sportsnak came to Piixel Designs in need of a complete service which included Brand Creation, Web Design, Development, Social Media and Email Marketing. Sportsnak came to us with a brief of setting up their full branding and development of a social network and Email Marketing. Also included in their branding was a heavy focus on developing their Email Marketing through our system The Global Communicator. Our approach was to first focus on creating the brand for Sportsnak and their associated assets including brochures, business cards and more. We also developed a complete social networking website which is run through an extensive network of servers. 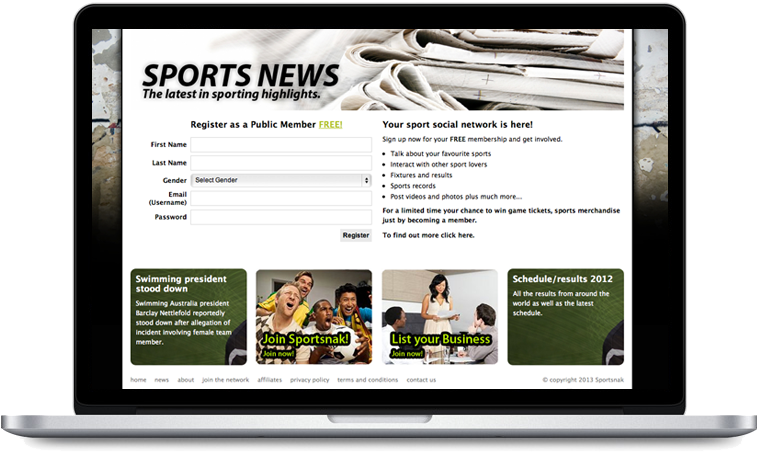 We launched Sportsnak's website and have had some great success with a large number of members signing up to their social network.